There’s a bug that’s okay to catch. It’s called the competition bug. 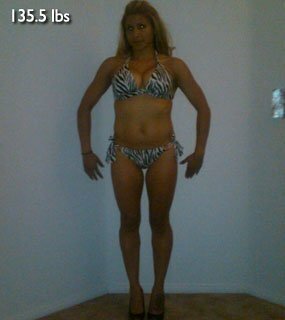 Learn how it helped Cynthia reach her fitness goals! I've been a track & field/cross country runner/competitor since the age of 4. I took it into my high school career where I did very well. I gave everything up to work three jobs to be able to provide for my family, having kids and being a single parent at a young age, which was tough to balance. I let my job, relationships and life just run me, and I lost myself somewhere along the lines which in turn reflected in my appearance. After losing my job of 10 years, I found myself trying to figure out what to do next. I did battle depression during this time which also contributed to the weight gain (max weight 175 lbs). After a few months I knew I had to figure out what I was going to do next with my life, my family and my job. I started doing what I knew how to do best and that was running, which is something I always felt kept me balanced on and off. I have put 18 years worth of miles on these wheels, so getting back into it was like "riding a bike." My body responded quickly and the more I saw changes the more I wanted to keep going, I started working out because it was time to get my body back! That stare of hers could cut through steel, let alone guys at the gym. In order to stay motivated, I started working out with friends and family. My friend Kerry started training with me after I challenged her, which helped her to lose over 40 pounds. My next challenge to her was to run a 5k ... she did. When she was done she handed me an OXYGEN magazine and said "My challenge to you is to pick a competition!" It was after June 25th 2010 where I saw my girlfriend from childhood Elena Andrade and my friend Raymond Querido compete in The West Coast Classic where I got the bug to get serious about competing. So I went for it. I competed in 5 competitions last year and placed 5th, 7th, 3rd, 7th and 4th! I work with Kim Oddo, he is my Nutrionist/Trainer/Coach. I use 3 sets of 15-20 reps for all bodyweight and band exercises for lower and upper body. The only body part I lift for is GLUTES! I train glutes 3 times per week; they have been my biggest problem area for years and I finally found what works. Diet and nutrition has been 80% of my success, so if you're looking for results you have to CHANGE the way you eat. Always train hard don't cheat yourself!